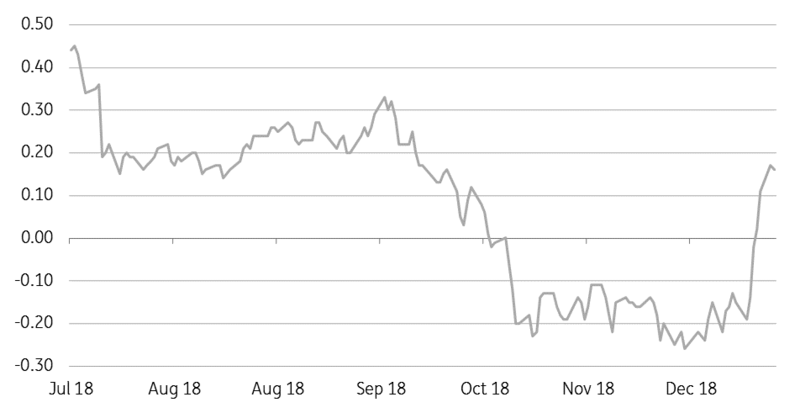 Brent spreads strengthen: The front-month ICE Brent spread has continued to strengthen, and is firmly trading in backwardation now. Having started the year at more than a US$0.20/bbl discount, the Mar/Apr spread is now trading at around US$0.17/bbl. The recent move does suggest that we are seeing a tightening in the prompt physical market. Furthermore, floating storage has declined this month after big builds over much of 4Q18. Meanwhile, the US market remains fairly weak, with the front end of the WTI curve comfortably in contango. Data releases: The EIA is scheduled to release its monthly drilling productivity report later today, whilst weekly inventory reports are delayed by a day due to a public holiday in the US yesterday. Therefore the API will release its weekly inventory report tomorrow, whilst the EIA will release its weekly oil report on Thursday. Zinc and lead balance: Latest data from the International Lead and Zinc Study Group (ILZSG) shows that the global zinc market witnessed a supply shortage of 97kt in November, taking the 2018 YTD deficit to 326kt – this compares to a full-year deficit of 452kt in 2017. Global zinc mine production increased around 2% in 2018; however low treatment charges (TC) weighed on refined output for much of the year. Since then though, Chinese TCs have strengthened to US$175/t from US$20/t in early September. Over 2019, both the concentrate and refined market are set to see an improvement in supply. The LME zinc cash/3month spread has weakened considerably in recent weeks- falling from a backwardation of US$77/t to US$8.50/t currently. Meanwhile, the lead market also saw a supply shortage of 35kt in November, taking the 2018 YTD deficit to 95kt, compared to a full year deficit of 147kt in 2017. Indian sugar output estimate cut: Latest data from the Indian Sugar Mills Association (ISMA) shows that cumulative sugar production for the 2018/19 season until 15 January totals 14.69mt, up 8.3% YoY. The stronger YoY performance was driven by the industry starting the season earlier this season. However, ISMA does estimate that Indian sugar production for the season will total 30.7mt now, down from their previous estimate of 31.5mt. The revisions in production have been supportive for the market, especially when you consider that prior to the start of the season, some analysts were forecasting that output could total more than 35mt. El Nino risk weakens: Australia’s Bureau of Meteorology believes that the risk of an El Nino weather event has passed for now, with Tropical Pacific sea temperatures cooling since late 2018. However, the forecaster sees the risk of El Nino occurring later in 2019, with a 50% chance of such an event over the southern hemisphere autumn and winter.